Betcha didn’t know I spoke Italiano. 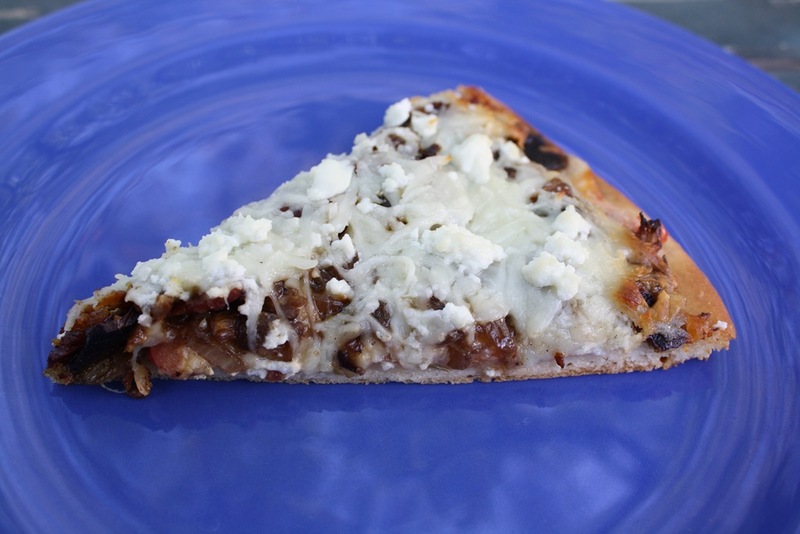 I mean it though, you are going to want to try these 3 pizza’s, ‘cause they are deeee-licious! Let me just tell you, due to some crazy circumstances and a whole lotta interrupting, it took me 3 1/2 hours to get dinner on the table. Yes, THREE AND A HALF LOOOONG HOURS. The kind of hours where Mommy wants to scream and pull her hair out. This is not a hard meal, not at all, just a bit of dough rolling, veggie chopping and cheese grating but I had a LOT of interruptions. Walking cleeeear out back to “ok” said garden plot. Paxton dumping out the contents of the lazy-susan. Paxton destroying my center island décor, twice. Paxton crying at my feet. Getting Ty in the bathtub to soak the stink off. Scrubbing the toilet before someone else needed to use it. Washing my hands, yet again. Avery stinking like her poo and needing a bath also. Draining Ty’s poo-poo water, sanitizing the tub, and running fresh water. Sticking Avery in the tub. Destiny complaining that I made her come in and wash up to help me by feeding sobbing Paxton his dinner. Child labor, poor dearie. I am up to my elbows in flour and pizza dough at this point, so when sweet Avery offers to take over the job of feeding Paxton, who will now wear the majority of the bowl of squash, I say yes, because I HAVE to get these pizzas in the oven! The dog is whining to be let back in. Finally, both pizzas in the oven, the 3rd on the counter, waiting. Paxton is done eating and crawling around. But wait, what is that smell? Eww! Deja poo’! Paxton!!!!!!!!! JEEPERS! How many times do I have to sterilize my hands tonight? I have practically scrubbed the top layer of skin off! Saute’ chopped onion in 3 T. melted butter over medium low heat, add the balsamic vinegar and cook 2 minutes longer. Set aside. 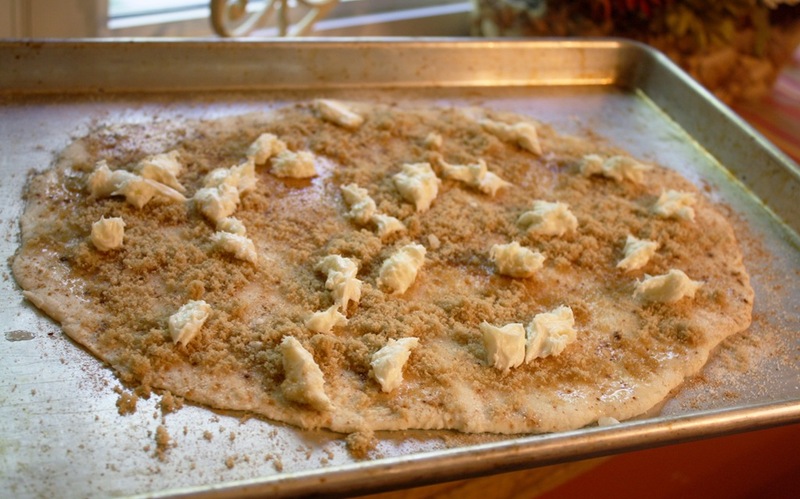 Following directions on yeast packet, make pizza dough and roll out on your favorite pizza stone. Season with garlic powder, rosemary, basil, whatever you like. Par-bake 5 minutes. Pull from oven and press thinly sliced roma tomatoes down into dough. Top tomatoes with mozzarella cheese, cooked crumbled bacon, more mozzarella and top with goat cheese crumbles. Bake 5 more minutes, or until cheese is melted and crust is done. Preheat oven to 450*. Make pizza dough and shape into 2 balls. Spread one ball of dough on a rectangle or circle stone, nice and thin. (Set other dough ball aside for another use) Drizzle with olive oil and season with Italian herbs of your choice, plus garlic powder & a bit of kosher salt. 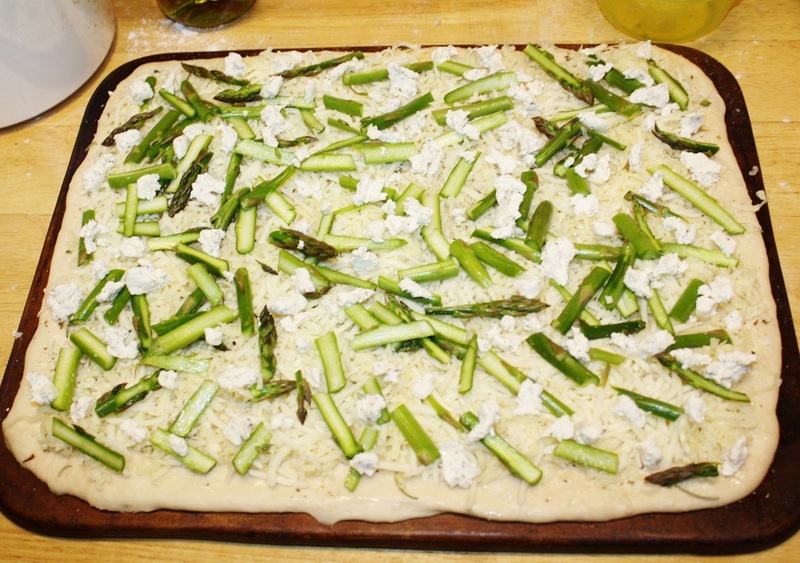 Sprinkle shredded mozzarella onto dough, layer on sliced asparagus. 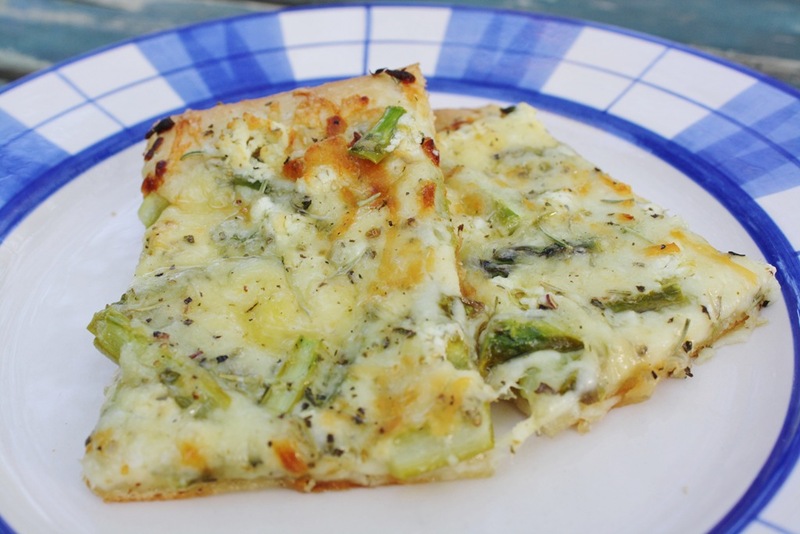 Crumble goat cheese onto asparagus layer. Top with more mozzarella and one last sprinkle of basil. Bake 15-20 minutes or until crust is just turning a golden brown. Loved this! Mellow delicious flavor, Dale didn’t even MISS the meat! It’s a MIRACLE! And last, but totally not least……. Spread dough into some resemblance of a circle. Melt 2 T. butter. 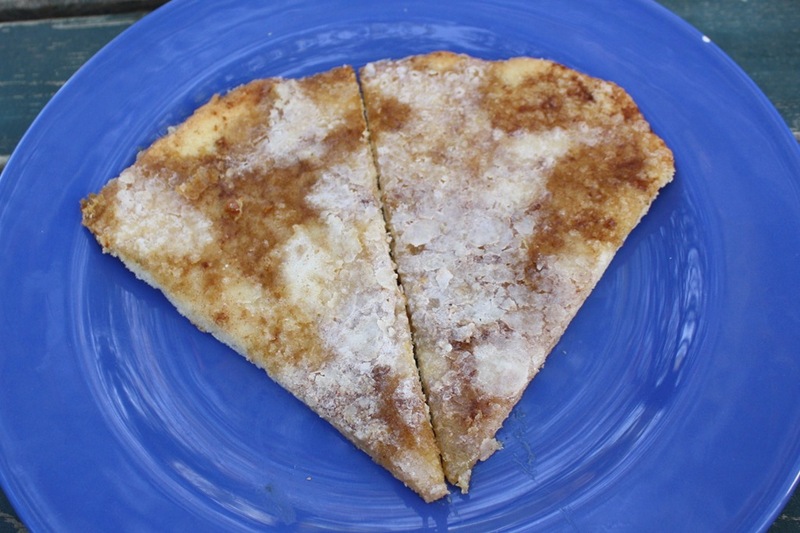 Drizzle and brush over crust, then shake on white sugar, brown sugar and cinnamon to taste. Dig in the back of your fridge for that container of canned frosting (Gasp! canned frosting?! What a sacrilege!) that you have leftover from that one time you couldn’t possibly manage making frosting yet too and bloop it all over the top of your sugar layers. I had vanilla frosting leftover, but I imagine chocolate or cream cheese would be good too! Bake pizza at 450* until crust is golden brown. Let cool slightly before cutting. Enjoy! These are simply divine. Gourmet Pizza flavors all the way! We loved them!